How we protect and support the physiological need of the human newborn attachment sequence is the foundation for creating safe birth wherever birth happens. No one can tell a woman what is best for her and her baby ... waterbirth, homebirth, hospital birth, doctor, midwife, Unassisted Childbirth (UC) or cesarean surgery ... it is for her and her baby to know. The best we can do is support her to access, trust, and know her own inner wisdom and communicate with the Being within her - the One whose birth it is through her womb and the man. - Janel Mirendah, Attachment/Birth trauma therapist, Filmmaker of The Other Side of the Glass. I paid for my "donation" copy of the other side of the glass add on to the trailer. When will I receive my copy? Please contact me promptly! Paypal completed on 2/10/09 and I haven't heard a word. Wonder if I can reverse it? I am glad I got that this week and not last week. I am in the midst of a last minute scramble to finish up what I can here in Phoenix as I am leaving Friday for a grueling 3 day trip (1200 miles and 3-4 interviews) to finish up filming. I will arrive in northern CA to work with my editing teacher on Monday after a long trip and interviews. This note was a good reason to stop and take time to update visitors and followers of the film about my progress. It's been on my "to-do" list. I am experiencing a computer challenge as I prepare to meet with my editing teacher in what was to be "polishing" of Part One. It will not be as ready as I planned. However, as is the nature of this amazing film that has a life of it's own, amazing things have emerged, much like it did in September in my trip to the east coast. But the good news is plentiful: Part one finally has a name, His Moment ... of Awe. I recently completed the DVD label and cover design knowing it will be adjusted as the film itself completes. I also connected with the person who is, as we speak, doing original music for this part. A major birth photographer is lending her photos. Everything takes a lot of time. Someone in Italy emailed me about translating the trailer. I spent three days on transcribing it in detail -- finally, crossing that off the list. I have someone to do Portuguese and Spanish and looking for French. All of these people are donating their piece to this part one. It is such a blessing. I intend for sales of Part One to fund paying them to finish their part in the completion of the film (two other parts). For those of you who are waiting so patiently, some of you since you donated in September and October, I wish to thank you, from the bottom of my heart, for your patience and support. I have tried to keep you updated via email but have not done such a good job here. Last week I sort of hit a wall ... I was (and am) so tired as I continue to do this as a one-woman team. Actually, as I learned to do in Trance Dance (check it out!) I danced along the proverbial "brick wall" examining and experiencing it. I have been aware since September's visit in SC with unassisted couples, that I am doing this film as if I were birthing my "baby" unassisted. It is also, above all else, a film to honor my grandson, Andrew; my daughter, Erin; my son-in-law, Osama, and my older grandson, Adam. They are the hospital birth family. I am the Grandma. My younger daughter, with me on this production, was the videographer. I have much support -- emotional, spiritual, and physical -- from around the world, but only these donations are the financial support. I had an internal tantrum, threatening to just quit, knowing that I can't, knowing I was just being like my three-year old grandson, Andrew, where I am living in Phoenix. I am just showing my frustration, independence, exhaustion, and determination. I am blessed and grateful for the opportunity to do this film as I am in awe of the message that has emerged and how important it is. But seriously, honestly, I have been frustrated with the lack of financial resources and the obstacles. And, while 99% of the time I am in awe of my accomplishment and the spiritual journey in this process, I am always in need of financial assistance. Aren't we all? The trailer was to be fundraiser trailer; to procure big funding, to hire experts and professionals, but I found that I was to do the work. Like an UC birther. So, since it's my baby, I am not sure how to ask for support for this film, except through offering a copy of the completed Part one when it is done. Like a homebirth/UC mother I know it is my baby and I need support, education, resources, and those who are more qualified than me to help. Me, personally, I don't want to borrow and owe people, and I want the energy of the film and funding to be reciprocal. Hence, the donation now, in exchange for the "First Edition, Fundraiser Edition" that I fantasize becomes a "collector item." I have big expenses coming up -- paying my editing colleague for assistance with the editing ($500), travel to DC in March ($500) and professional burning of the final product in late March or early April ($500). This is what sent me into a "little tizzy tantrum" with God, the universe, Whoever. I don't know where the money will come from and this is nothing new, but I am at the end of the birth, in transition, where the great amount of energy is needed to birth this amazing baby. I am tired. And, the journey makes me so grateful. I bought myself a new $6 bra and a pair of $20 pants last week -- my first in two years. Everything goes to my daughter and to the film. I have been blessed with "in-kind" donations to make this film happen. One year, rent-free, in a wonderful duplex in MO, "home" while I zig zagged across the country for six months, and while I spent six months working 50 hours a week, learning the editing software and editing programs for community access television station. My ten-year old grandson sat with me last night watching me transcribe video (I let him listen to Sarah Buckley in reverse and had him convinced that I was translating from a foreign language!) and he asked, "Granny, who pays you your pay check?" I answered, "I don't get a pay check.... but people are donating money so they can get a copy of the film, and later, a lot of people will be buying the film." Beyond the financial situation and the yearning to get back to working with babies and families, is the passion to just get this information out to the public -- the wonder at how amazing the information is, how it can contribute to transforming birth in our society and to transforming humanity. Being in my grandson's presence (and his brother's, Andrew, in the film) I am blessed. Baby Andrew is an amazing soul who came to give us this information. Sometimes he and I just gaze into each other's eyes and I melt into the universe in a moment of bliss. I had one of the moments in the car taking him to his other grandma's house. We were making eye contact in the rear view mirror. The music on the radio, which ironically, I can't even recall, heightened "the moment of awe" (hint, hint) with him and I was transported in a moment of bliss. I cried. The film is for Andrew ... and all of our babies. Sooooo, a musical fundraiser planned in MO isn't happening this month. Rather than be in a tizzy, last week I started to develop a format to do a "Fundraising Party" based on my producer-friend's "how to" book, but I just don't have time to add that job to my current work load -- of finishing (birthing) Part One. I am still working totally alone. If someone would like to take on that role, to set up a format, contact people, network on Facebook, I could help and hand it over. I wanted to ask people to have a little party in their community and show the trailer and take donations for a first edition, fundraiser edition of Part One. 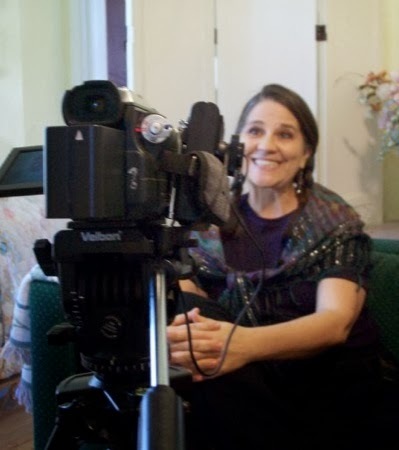 Part One is really designed for doulas, childbirth educators, midwives, and women to give to their men, and other than child support and "in-kind donations, is my only resource for funding my living expenses while I complete the rest of the film. This fundraiser edition will include the Intro (expanded trailer) and Part One: His Moment ... of Awe. Part Two is not yet named but looks at men's experience of transformation when they have experienced a powerful woman who trusts and knows her body works ... and births powerfully. Part Three will get into the world of pre and perinatal psychology, the wounding of men since their own birth, the healing of birth experiences, and impact of empowered birth on humanity. So, taking this time and opportunity to update folks, I want to ask for your financial support by donating at least $15 in exchange for a first edition fundraiser edition copy of Part One, and to consider showing the trailer at a house party and collecting other donations. If someone one wants to create and manage fundraising, please let me know. Also on my wish list is an RV as I plan to travel to do extensive interviews of the OB's in Part One, amazing people doing science-based, mother-baby focused obstetrics for the next project. The film is in production, as is indicated in the blog. I am doing this film as a one-woman team. I am still filming .. completing filming for Part One this weekend as I travel from Phoenix to San Diego to Los Angeles, and then to Nevada City, CA with the plans to finish Part one, then travel to Washington DC in a car with 200,800 miles on it to screen it to a group, to film a birth for part one, and to then wrap it up and get it professionally burned. I travel in prayer, I tell you. I am doing every single bit of it -- including thank you's for donations, which I had not yet gotten done for you. THANK YOU. People who donated in October and beyond are also still waiting, and I am so appreciative of their interest, support, and patience. I don't think people realize how precious and important that $15 is and how far it goes and what it means to me and the film. I am often waiting, as I was this week, for child support to come in to do this next leg of the trip. I do not have credit cards and this film, unlike many, will be done without "debt". This months allocation (child support) will not get me to DC, and I have no idea at this moment how I will pay for the trip to DC. I am leaving Phoenix where I have been living with my daughter and family (grandson!) having given up my home a year ago -- to do this film. It is a place where I can work on very tedious aspects of the film. I have been traveling off and on for over a year now .... with a 15 year old, a dog and a cat .. 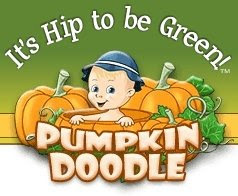 This film is an act and labor of love -- baby Andrew is my grandson and Erin is my daughter. The donations are the only funding I have other than child support and acts of kindness -- lodging, meals, etc. I feel I am in late stage and transitional labor. I hope you can appreciate the process and bear with me ... I am laboring heavily now and birthing this baby very soon. Like every birth, this film has it's own timing and process. Like a woman in labor, all I can do it go with the present contraction. I appreciate your support more than words can say. Part One: The Other Side of the Glass: a Birth Film for and About Men officially released in digital download format on June 2, 2013. Go to www.TheOtherSideoftheGlass.com to purchase a digital download. Men have been marginalized in birth for a long time. The old joke is that a man was sent off to boil water to keep him busy. I believe they were making the environment safe. Birth moved to hospitals and for forty years women were separated from their partners who was left to wait in smoke filled waiting room. Finally, he would see his baby from "the other side of the glass." Now a man can go in the birthing room and even get to hold his partner's hand during surgery. But they are still marginalized and powerless, according to the fathers I interviewed around the country. Historically, birth has been defined by the medical establishment. The midwifery and natural birth movement now advocate for need "to educate and prepare men to protect their wife and baby" in medical environment. Seems logical ... if we process with the same illogic that got us here. Through the voices of men - and doctors and midwives - men share heart-touching stories about how this is not workin' out. A man is also very likely to be disempowered and prevented from connecting with their newborn baby in the first minutes of life. Now is the time for men to take back birth. The film is about restoring our families, society, and world through birthing wanted, loved, protected, and nurtured males (and females, of course). It's about empowering males to support the females to birth humanity safely, lovingly, and consciously. Donors, check your emails or email me at theothersideoftheglassfilm@gmail.com for info to download. Release on DVD is not planned at this date. "The Other Side of the Glass" has the potential to open up feelings that have been denied and ignored for a very long time. How to heal the trauma of birth at any age will be addressed in the film. Meanwhile, these are pioneers in the field. In both relationships and life trust begets trust. Be the spark, especially when it's dark. This is such important work. We are in the midst of a terrible trend of over intervention into birth, resulting in trauma and distress. Your films will show the core of the unexpressed pain for parents and for the baby. Janel, I watch a lot of birth videos (my wife is a midwife and it seems to be some sort of professional obligation). Recently I have been horrified by what I see. Watching the previews you've had up recently has changed the way I understand what I am seeing. This is especially true around the parts dealing with, "What would it take to make an adult scream like that?" You have changed the way I think about, view, and evaluate births that I see and hear about. My feelings about the birth of my own children has changed. Really, my world has changed. Digital Release of the Film - Get your copy! Wake up! It's the baby's birth! Abortion and Birth: A Means to an End. Control. My old website in is available on an online cache. I am so grateful as I lost the website and data when I started the film. Check out this page on self-attachment/breast crawl. Wow, thank you for posting that. It brought a few tears to my eyes! The part where the doctor is "prying" the newborn out of the mother's arms... and she is so helpless, her legs open, just having given birth, naked... so disempowered in that moment with her own child that she worked so hard to grow and deliver!! And I never realized how disempowered the fathers must feel too... very eye-opening in that regard. Pretty terrifying actually, and I'm glad I'm planning a home birth. Well, I finally had a chance to check out the trailer and .. wow! It's nice that they're acknowledging the father has more than just cursory rights (of course mom's rights are rarely acknowledged either) and it's great that they're bringing out the impact of the experience on the newborn, but I'm really impressed that they're not shying away from the political side. They are rightly calling what happens in every American maternity unit, every day, by its rightful name - abuse. Abuse of the newborn, abuse of the parents and their rights, abuse of the supposedly sacrosanct ethical principal of patient autonomy and the medico-legal doctrine of informed consent, which has been long ago discarded in all but name. I love it! In the immortal words of the "shrub", "bring it on!" This film needs to be shown and if I can help facilitate or promote it, let me know. OMG'ess, I just saw the trailer and am in tears. This is so needed. I watch over and over and over as fathers get swallowed in the fear of hospitals birth practice. I need a tool like this to help fathers see how very vital it is for them to protect their partner and baby. I am torn apart every time I see a father stand back and chew his knuckle while his wife is essentially assaulted or his baby is left to lie there screaming. Please send me more info!!!! Thanks for sharing this. It was very touching to me. I thought of my brother-in-law standing on the other side of the glass when my sister had to have a C-section with her first child because the doctor was missing his golf date. I'll never forget his pacing back and forth and my realizing that he was already a father, even though he hadn't been allowed to be with his son yet. “Hold on a minute!” I said. “I want her to go to her mother.” I looked over at Sandy’s exhausted, filmy eyes and the look of panic on her face. “No, we’re sorry,” they replied firmly. “Hospital policy.” Having proclaimed this, they strode purposely forward toward the door just to my left. Suddenly it seemed time began to slow. Looking back, it seems almost like some sort of bizarre operating-room football game. The doctor, with my child tucked under his right arm like a halfback, decided he would simply ignore this irrational father, take a step to his right and scoot on past my left elbow and through the swinging door. I don’t know what he expected I would do, but I certainly know his eyes looked surprised when I made my move. "The reason that ego and love are not compatible comes down to this: you cannot take your ego into the unknown, where love wants to lead. If you follow love, your life will become uncertain, and the ego craves certainty." The Other Side of the Glass will feature original music by Michael Stillwater. 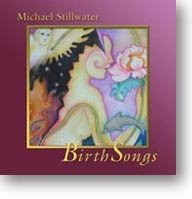 Click picture to visit his site and purchase Birth Songs CD and see his other works.